In the heartland of Des Moines, Iowa, there exists a gem of a museum called Salisbury House. Built in 1928 as the family home of Carl and Edith Weeks, the 42-room mansion graces a 10 acre estate. The Weeks family occupied Salisbury House for 26 years, then donated the home to Drake University. However, the University could not take advantage of the property and sold it to the Iowa State Education Association in the 1950’s for use as office space. The maintenance and costly repairs to such a unique structure soon began to overwhelm the association, and they were faced with selling the property. Local preservationists recognized the value of this beautiful estate and formed the Salisbury House Foundation in 1993 to negotiate its purchase and restoration. Renovation of Salisbury House started in 1996. Restoration plans called for the creation of a visitor center in what was formerly the carriage house. This segment of reconstruction, initiated in 2001, presented some serious challenges. The carriage doors had been removed and replaced with windows. Separating walls had been dismantled, the brick, painted. Although the archives at Salisbury House contained original house blueprints, these documents were not necessarily a reflection of reality. Using a combination of blueprints and old photos, the architectural firm determined the original composition and design of the unusual bi-fold carriage doors and hardware. Drawings from 1928 referenced Richards-Wilcox product, so the architect contacted the company to inquire whether track, hangers, support brackets, handles, strap hinges, backplates, and spring bolts were still in production. New laser cutting technology resurrected designs that had been made obsolete. 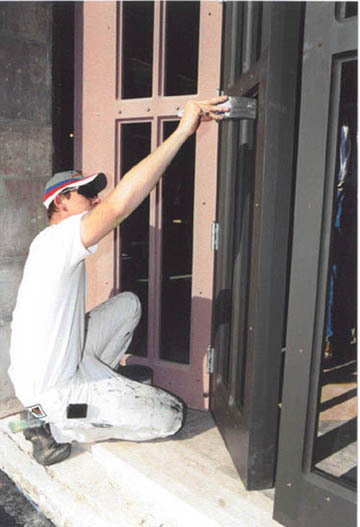 Within a short time, the “antique” hardware was ready to ship and install on the new carriage doors.